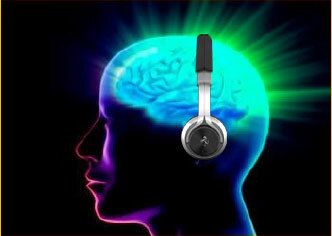 Research has found that Binaural Beat Brainwave Entrainment works the best when it is tuned to you. Each brainwave state has a range of rhythms and everyone’s specific rhythm is a little different. Binaural beats are created when two tones are detuned from each other by a small amount. For example, if you have a tone generator creating 100 hertz and another one putting out 102 hertz you will hear the difference between the two tones, which is 2 hertz. Whenever this frequency matches a particular brainwave state, such as Delta, Theta, Alpha, Beta, or Gamma, it will entrain your brain into the same brainwave state within a minute. The science behind this is well researched. Using EEG you can see the brain vibrating at the same rate as the Binaural Beat. DELTA – .5-4 cycles per second – Helps to go to sleep and sleep deeper and longer. Also, going into Delta during meditation can make you feel like you have slept. THETA – 4-8 cycles per second – This is a the relaxed state of daydreaming. It is the best state to be in for creativity — especially art or music. It also helps get you into “The Zone” that people experience when in gratitude, love, joy, blissed out, or in a state of “oneness with the Universe.” It is also the state that a hypnotherapist gets you into — where you can access the subconscious and re-program it. ALPHA – 8-12 cycles per second – This can help with presence and relaxed attention. It is also helpful for memory and mental acuity. It is best state to be in for learning and doing sports. BETA – 12-20 cycles per second – This can help with mental processing, thinking, and figuring things out. It is also a state that many with ADD/ADHD cannot access. It is a very fast rhythm so they often give people speed (ritalin) to help speed the brain up, so it can think. Listening to Beta frequencies can help entrain the brain into this faster state and help overcome ADD/ADHD. GAMMA – Over 20 cycles per second – This state is a high state of meditation. It is an extremely conscious state where the world seems to slow down. When listened to on headphones the combination of frequencies provide powerful entrainment into these states — and they are all tuned to you. It is also cumulative since it creates new neural pathways. At the Institute, we put you on the Sound Table and play each of the 12 notes to see which one makes you the most peaceful. The assessment takes about 20 minutes. We then make a CD for you and play it for you while you are on the Sound Table. You then take all 4 songs home and use it as often as is convenient for you. We can also send the downloads if you don’t have a CD player. The cost is $148 and takes about 1 hour total. Once you purchase the online version, we send you a link to our site that has the BETA brainwave states in each of the 12 notes. You will listen to each of the 12 notes and then read a couple of paragraphs from a book that is a little difficult to read. After listening to the first brainwave note and reading the passage, you will rate yourself on a scale of 1-10 as to how well you could focus and retain the information in the reading. Once you have completed rating yourself while listening to each of the 12 notes, you choose the winner. If there is a tie, there are further passages to read to help break the tie. Once you have figured out the winner, email us and we’ll send you the CD download. You will receive 4 songs tuned to: Delta, Theta, Alpha and Beta. The bass of each song is tuned to Gamma. Each song is 20 minutes each. The key of the song and the Binaural Beats are tuned to you. The song is “Awakening.” It is very pleasant to listen to and has the Binaural Beats embedded in the background. Listen to the appropriate CD depending on what you are trying to achieve (see the brainwave states above). The CDs actually do work on normal speakers. They are a little more effective on headphones. Also, when you wear headphones, not only do you go into the particular brainwave state, you synchronize your left and right brain across the Corpus Callosum. Having your left and right brain synchronized is an ideal state — particularly for creativity or dealing with life. You can listen for 20 minutes or longer if it feels good. You can also put the CD on the background — it is good background music.